Chelsea coach Maurizio Sarri insists he has no regrets about how he behaved after Kepa Arrizabalaga refused to be substituted in Sunday's EFL Cup final defeat to Manchester City. After the two sides played out a 0-0 draw over 120 minutes, Chelsea went on to lose 4-3 in a penalty shoot-out, but the match was marred by a bizarre incident towards the end of extra time. Chelsea goalkeeper Kepa twice went to ground appearing to need treatment, but when Sarri tried to bring him off for Willy Caballero with penalties looming, the Spain international simply refused to be replaced, adamant he was fine to continue. Sarri reacted furiously on the touchline and started heading down the tunnel, eventually turning back and remaining in his dugout until the shoot-out, before which Antonio Rudiger had to hold his coach back as he shouted at Kepa. 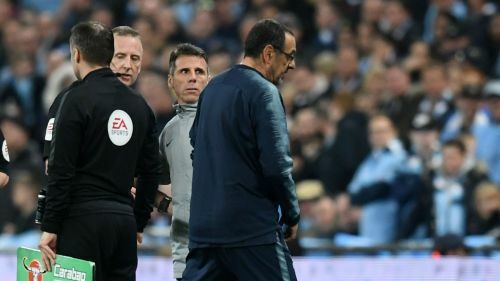 Although Sarri played the situation down as a "misunderstanding" in his post-match news conference, Kepa has since been fined a week's wages and the Italian's behaviour questioned. When asked if he regretted his own demeanour, Sarri told reporters: "No. Why? Because I needed one minute to return in my mind, I think. "I was really upset in this moment and I needed to return calm and in control of my mind. It was a big misunderstanding. I didn't want to go to the penalties with a goalkeeper with cramp. "I think that I took only 40, 45 seconds. I spoke with the players, very briefly because we had only to kick penalties, so I have to say five names, not [discuss] tactics. When the match started again, I was on the bench. "The goalkeeper is not a problem. He made a big mistake, but he is really a very nice boy. There is only one difficult [thing]: the results. "The atmosphere in the training ground is now really very good. The application of the players is better than before. The problem now is to have results with consistency." The embarrassing situation arguably could not have come at a worse moment for Sarri, as the Italian's future is constantly being questioned and many suggested Kepa's actions undermined the coach and proved he has lost support of the players. But Sarri says the club have not said anything to him about his future, with director of football Marina Granovskaia only talking to him to wish the team well and then discuss Kepa. "I spoke with Marina this week, before the final, just for good luck," Sarri said. "I spoke to Marina after the match about the Kepa situation. My relationship with the club is like before. We spoke about the Kepa reaction, only about this."